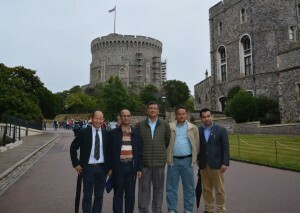 Nepal’s Defence Secretary, Mr Mahesh Dahal and Nepal Army’s Chief of Staff, Lieutenant General Purna Chandra Thapa undertook a tour of Windsor Castle on Saturday 10th September 2016. 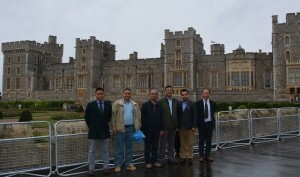 The informal visit was sponsored and arranged by HQ Brigade of Gurkhas. Both Mr Dahal and General Thapa arrived in the UK early in the week as part of Nepal’s Ministry of Defence delegation to attend a UN security conference in London, and returned to Nepal on Sunday 11th September 2016. Mr Dahal and General Thapa arrived at the venue at 1000hrs and were received by Deputy Chief of Staff Brigade of Gurkhas (DCOS BG), Major Surya Rai GSPS on behalf of Colonel Brigade of Gurkhas. 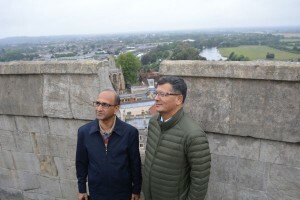 They were accompanied by Colonel Pradeep Jung KC and Mr Tejendra Regmi – Defence Attaché and Attaché at the Nepalese Embassy in London respectively. The Castle’s representative on the day was Mrs Sue Hiscocks who delivered the tour with her colleague, which included the venue’s major attractions such as the State Departments and the tower. Prior to the start of the actual tour, the visitors took time to visit the 15th century St Georges Chapel and the DCOS BG acted as the impromptu guide for the occasion. They then took a tour of Windsor Castle leaving the venue at lunchtime for their next commitment in London that afternoon. Needless to say, the visit went exceedingly well. The high-ranking delegates expressed their gratitude for the opportunity and said a huge thank you to Colonel Brigade of Gurkhas for having arranged and sponsored the visit at very short notice.